Daniel Perez started his training in Kenpo Karate 25 years ago, and presently holds a 5th-degree black belt. Mr. Perez completed his seventh year of instructorship requalification! (only the first three years are mandatory, the remainder was voluntary). 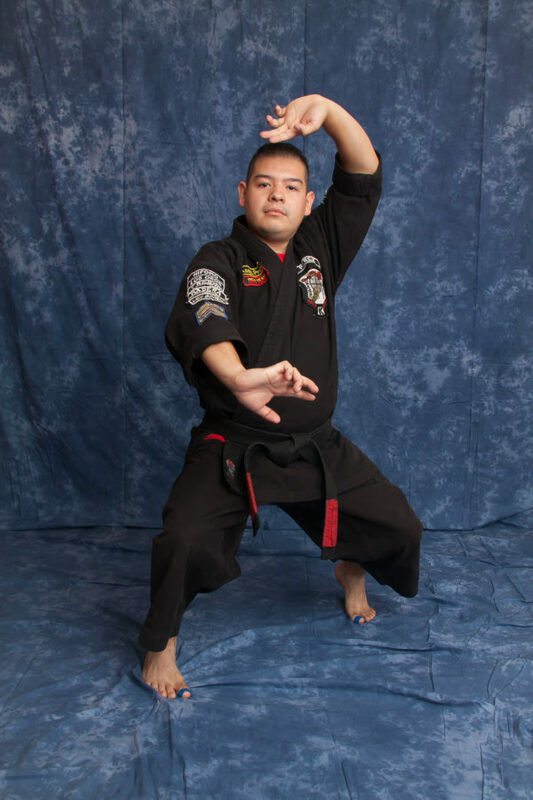 With his infectious positive teaching of the martial arts Mr. Perez makes learning the Martial Arts very enjoyable, fun, and challenging for all ages, While including Leadership Skills that can help take students to the next level in life! In 2005 he completed his thesis on the subject of teaching the 4 to 5-year-old age bracket and the special challenges connected with this age level. Also in 2005, Daniel earned his 1st Degree Black Belt at the age of 17yrs while also completing High School at the same time! Mr. Perez has taught in multiple cities from the Central Valley to now the Central Coast! In 2007, Daniel Perez continued his journey by earning his 2nd Degree Black Belt and attaining the rank of associate Instructor. With his added responsibility of traveling to help assist in teaching Kenpo in three different locations every week! Presently now Mr. Perez and his Fiance (Ms. Martinez) own two locations in Nipomo, Ca and Los Osos, Ca. Has Completed the five level, full-time, Instructor’s qualification program through Central Coast Kenpo Karate Council. Completed the full and complete Instructor’s Certification training as prescribed by NAPMA (National Association of Professional Martial Artists). Passed his test for instructor certification through MAIA (Martial Arts Industry Association). Made all of his weekly instructor training classes. Completed his 190 hours internship (supervised). Daniel Perez started competing as a child and has represented Kenpo with respect, and is the Only Black Belt from Central Coast Kenpo Karate to win first place in Forms, Freestyle and Self Defense division in both National and International competition! Jenny Martinez started her training in the martial arts, 11 years ago at the age of 15yrs, and presently holds a 3rd degree Black Belt. she has been teaching for about 9yrs and has been qualified under the supervision of training and requirements set by the head instructor. In 2013 she wrote a thesis on how the martial arts can help change your character and mold you into a positive leader. Her influence and leadership have impacted students of all ages and a great role model for the ladies who train under her for guidance. Her continued effort to help students and giving back to the art of Kenpo has been a phenomenal journey of perseverance, and dedication of self-improving along with giving back to the students. Ms. Martinez is the head marketer and program director for both Nipomo and Los Osos Schools. She is also the main pewee instructor for the 3-4 years age bracket for both for locations. In 2014 Jenny Martinez completed the Five Level, full time, Instructor qualification program of the martial arts in Kenpo Karate. Completed the full-time requirements, with the completion of the Instructor Certification Program with Central Coast Kenpo Karate with head instructor supervision. Passed her test for instructor certification through the council of Central Coast Kenpo Karate. Made all her instructor training classes. 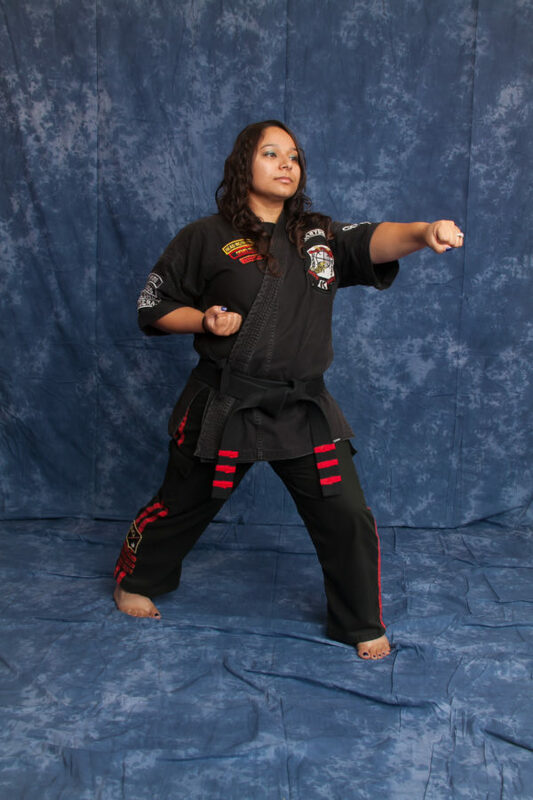 Jenny Martinez is also one of the very few and the ONLY Black Belt in Central Coast Kenpo Karate to achieve Weapons Champion, Sparring Grand Champion. Forms and Self Defense Champion. She has competed and placed in multi In-house and open tournaments.